In the past year or so, “deal of the day” type sites have been popping up all over. In the UK, we have Groupon*, LivingSocial, KGB Deals, Keynoir*, and more are appearing all the time (even the Telegraph seems to be doing some sort of deal site now!) The biggest of these sites seems to be Groupon*, and its the one I’ve used quite a few times myself, so thats what I’ll refer to. On the left, it says how much the current deal is (Ã‚Â£9), how much you’ll save by buying it (Ã‚Â£11), how long the deal is up for (assuming it doesn’t sell out – 36 hours) and how many have been bought. In theory, there is a minimum and maximum limit – if under the minimum buy the deal in the set time, then the deal doesn’t go through, and you don’t pay any money. I’ve never seen a deal be under the minimum amount though! The voucher/code is usually emailed to you the next day (although it might be different for the ASOS voucher as thats due to last for more than 24 hours) and if there are no set limits on when you Ã‚Â can use the voucher from, you can get ordering straight away! For things like meals and beauty treatments, you usually have to mention that you’re using a Groupon voucher at time of booking, but that doesn’t (or at least shouldn’t) affect the service that you get. I think I’ve covered most things that you’d want to know, but if theres anything else, ask! I’ll answer any questions in the comments. Oh man. Wrong time to do this post for me I’m afraid. I’m currently trying to get a refund on my THIRD deal with Groupon that’s gone badly. Not even badly, just been a total disaster. Every time it’s been down to either misinformation as to when you can actually use the deal (and yes I can read perfectly well) or just the absolutely appalling standard of the places it’s choosing to do deals with. The current deal was for a lovely restaurant in Hull. I read the small print. It said limited availability on Friday and Sat. I buy the voucher. I phone up the restaurant and it turns out it’s not avaiable AT ALL on Friday or Sat. Now Groupon are stringing me along to wait out the 7 days I have before I can get a refund. If I don’t get a refund that will bring the total amount I’ve spent with Groupon to over Ã‚Â£50 whilst I have got nothing in return. I absolutely refuse to do business with them again, don’t trust them as far as I can throw them. Wow, that’s crap. Sounds like the venues didn’t give the right info, or Groupon published the wrong info. They can be pretty slow to pick up emails, but if you’re requesting the refunds within the 7 days, you should be entitled to it! I was a bit scared of Groupon to start with but since Hayles helped me with my first purchase (the Lomography one) and that was all fine, I’ve bought one for a play place for my nephew and sister to have a day out, haven’t used it yet though. 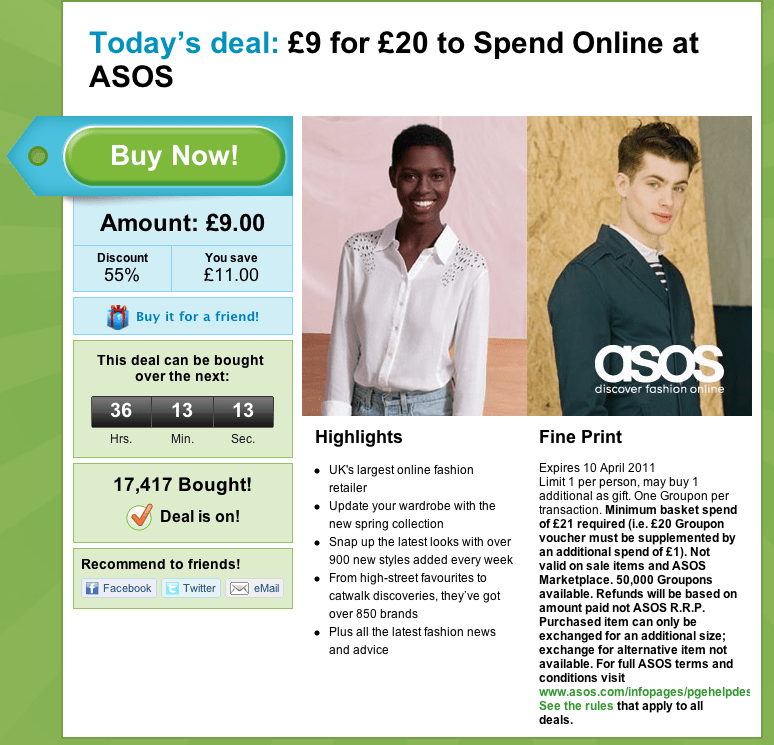 Am tempted by ASOS one, not for use on sale items though =( I love a bargain!!! How is your fisheye camera? Have you developed a film yet? I’m both a Groupon user and advertiser. We offered a sports massage at my sports therapy studio for Ã‚Â£14 instead of Ã‚Â£40. It’s been great for us, we’ve got loads of new clients and are meeting some lovely, interesting people. The only thing I will say from the suppliers point of view is to be patient. For beauty treatments, hair stuff and such like, you may have to wait a while to get the slot you want. We weren’t told that you can cap the deal and as a result had 430 people buy it! We can only offer so many Groupon slots per day-companies don’t make much money after Groupon have taken their commission (we didn’t do it to make money-more for exposure) and we still need to have appointments available for regular clients otherwise we’d go out of business! We were also getting up to 30 phone calls a day when the deal first went out so if you go for a popular deal, if you can wait, give it a few weeks before calling and aim to book your slot a few weeks in advance. Good article, explains it really clearly. Unfortunately, much as I’d love to use Groupon, they have refused me ‘due to the nature of the business’. They just don’t get it. I love it, went for the red one in the end, haven’t developed any yet, since it’s proper film I’m being careful with it! Good thing is it means it will take me a while to get it developed and there’ll be lots of lovely surprise photos! I would have been all over that ASOS deal! Here is the thing….if I offer a massage at $15 instead of $40. I get my customer…why would they come back, when every week they run the same deal for another salon. That same customer is more likely to take the deal with another salon than come back to me, as they clearly love a bargain. They run the same deals all the time. Same theory goes for restaurants. You would take a deal with someone else just to save the cash as this is the nature of the beats that buys the vouchers. Are we that busy looking at fair trade in all the third world countries that we have gone mad and can’t even look after the small business’s on our own doorstep. But free will lets business take up these ridiculous deals because they are already in a hard place and hope that this will help them drag their business through what is a very rough time. I have seen these deals break more than make…I for one will never buy a voucher online again.